Living rooms are essentially the heart of any home – they’re the place where everyone goes out to relax, let loose and enjoy some quality family time. 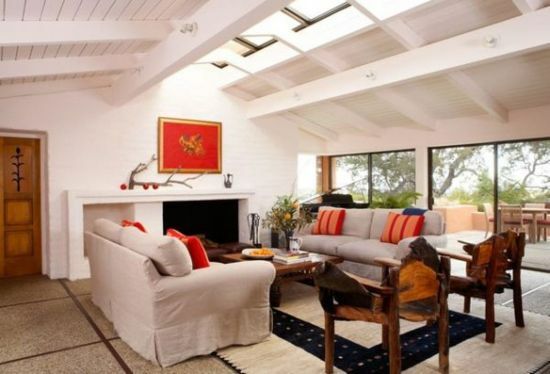 Living rooms with skylights are an uncommon but completely extinct species. Most of the time, a living room is in the middle fo the house, where though there are windows, there isn’t quite room for a skylight. 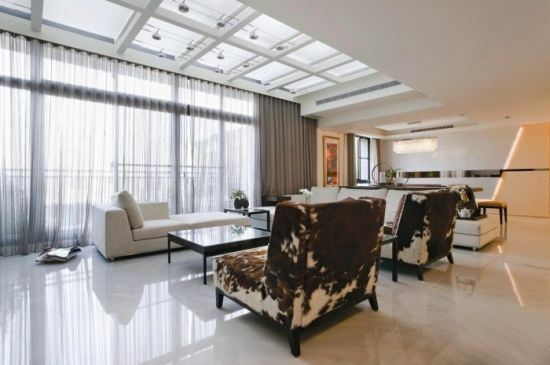 But contemporary style living rooms now come with a number of unique installments that gives the user a newer perspective on the space and the ambience. 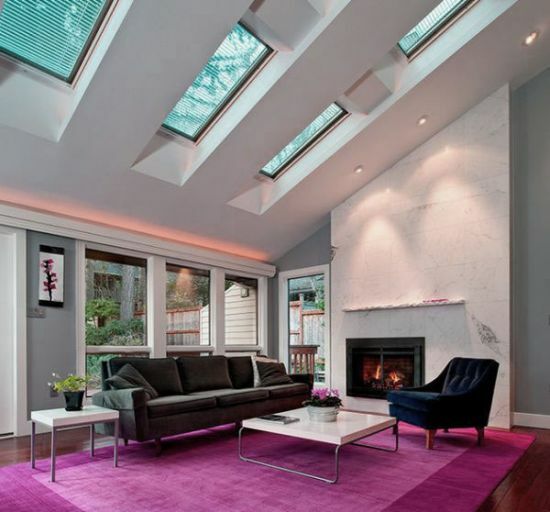 The concept of living rooms with skylights is not quite taking the world by storm, but it is definitely uncanny enough to guarantee a second look. 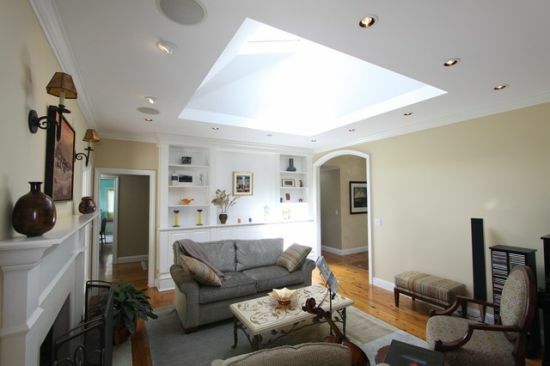 A layman would describe a regular skylight as an opening in the ceiling that lets in natural light and views. It is the direct decedent of the renaissance cupola, but with a lot of modern flair. The basic body of a skylight is mostly steel structure and clear glass, and they seem to make a living room seem more glamorous. 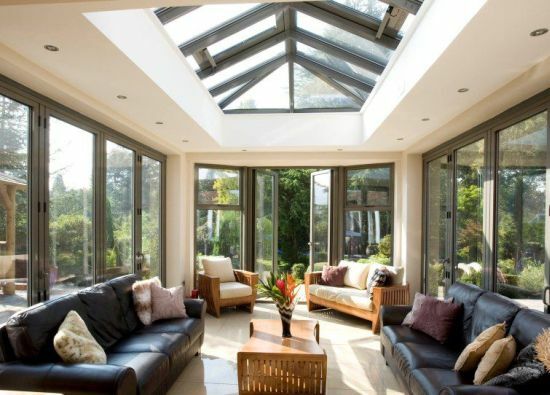 Today, we will be looking at some amazing living rooms with skylights. The rooftop skylight is located directly in the middle of the room, and often becomes the focal point of attraction. Most of the living room furniture is arranged around this skylight, which lets in natural light like an organic spotlight most of the times. 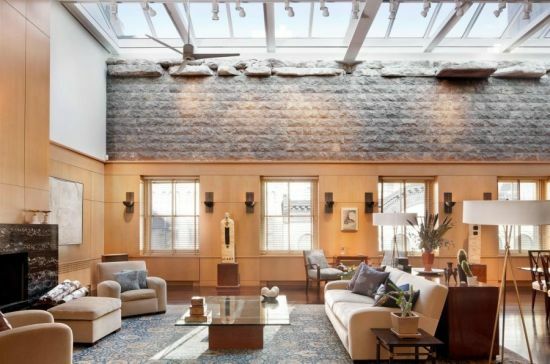 Of course there are various ways to design a skylight, and one of those include paneling the entire ceiling of the living room to retrofit a large, ceiling style sky light. This one makes it seem like there is no roof above, but the greenhouse effect during the summer heat could become quite enhanced. Pitched roofs are decidedly stylish, and when you incorporate them into a fun contemporary interior, they can be even more alluring. 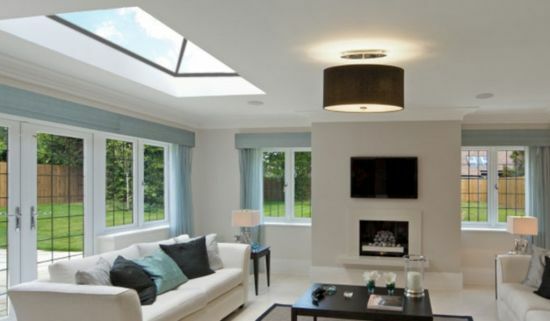 A pitched living room skylight is a window of glass that is fixed into the pitch of the ceiling to let in an abundance of sunlight and natural views. A grid patterned skylight is exactly as the name suggests – a grid of panals with alternating glass and concrete fixed in a pattern. This skylight looks very sophisticated when attached to the ceiling. It can also be used to create alternating light patterns inside the room with the help of these grids. 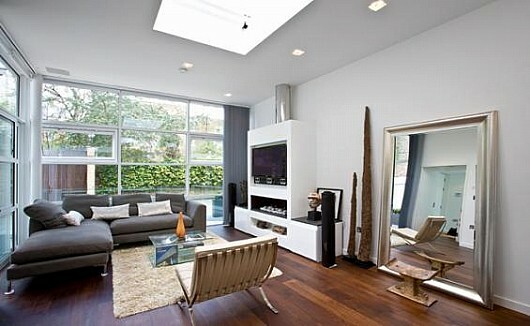 As the name suggests, the side living room skylight is one that is constructed on the very periphery of the room. This can help highlight some show pieces that are arranged below, so that the most important ones are arranged below the spotlight coming from the side skylight. Constructed much like a dome with a ribbon as its grounding attachment to the ceiling, the cupola skylight is always in the center of the living room. The main disadvantage of this one is that you cannot construct enclosed rooms above your living room to make this skylight functional. 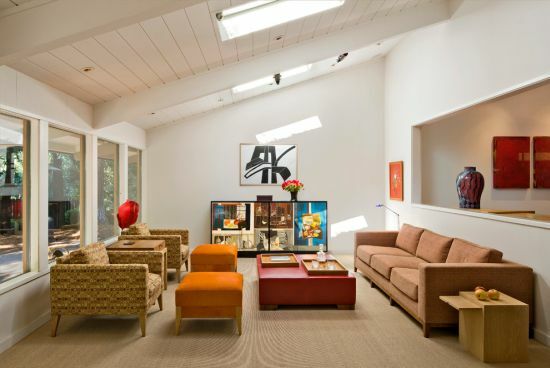 The full-sized living room skylight spans over partial living room roof. It gives off a very holistic vibe and is more pragmatic than a small ornamental skylight. It allows in an abundance of sunlight, and can help make your space seem more organic and natural. If your living room is located under a pitched roof, then the strip living room skylight would be the most stylish option to go with. It is an elongated, horizontal frame of glass on the top of the pitched ceiling. If you do not want a skylight that is raised on any kind of steel structure, and is just affixed to your ceiling in a flat formation then the fixed living room skylight would be the way to go. If you do not want actual sunlight streaming into your home, and will be satisfied with diffused light then the frosted living room skylight is the one for you. In it, the clear glass frames are traded in by the frosted glass frames, and can be fixed into any kind of skylight. Skylights or roof lights as these are called can offer a refreshing change to the decor of your living room that previously seemed dull and dark. 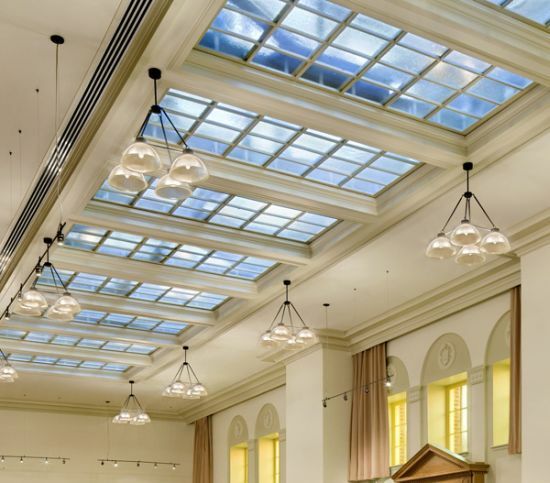 A skylight’s main function is to offer ample light and ventilation to keep the flow of good vibes going on continuously. 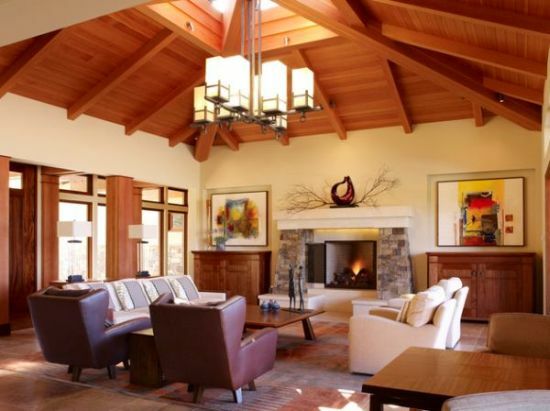 The exotic living room seen here features central roof lights or skylights in wooden frames that seem to slant both ways. This kind of design suits such homes that receive lots of snow or rain and prevents stagnation or condensation of water. Apart from the skylights, the room is adorned with large windows surrounding it from all sides, thereby allowing natural elements to come and freshen you up. 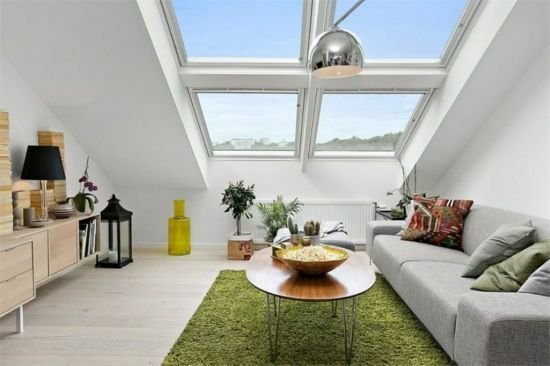 Skylights as such are windows fitted on the roof but unlike windows, these allow you to enjoy sunlight and fresh air all the time without you having to worry about your privacy. Skylights also help one to do indoor gardening as light seeps through almost all the time and gives a new breath of life to your plants. The grid of skylights seen below add luster to the whole space without actually piercing your eyes with direct sunlight. The built is flat and looks marvelous against the white roof and the walls. The living room and the open kitchen in the image look more than just adorable, courtesy the accessories and furnishings, but there is another feature that makes the decor appear so lively and fresh, and that would be the skylights fitted on the slanting ceiling of the house. The skylights can be your next best alternative to windows when you want sufficient lighting and fresh air to circulate inside. Fixed skylights cannot be removed or opened once these have been installed. Living room skylights come in a number of styles and a particular design that is seen fitted in maximum houses is the fixed variety. 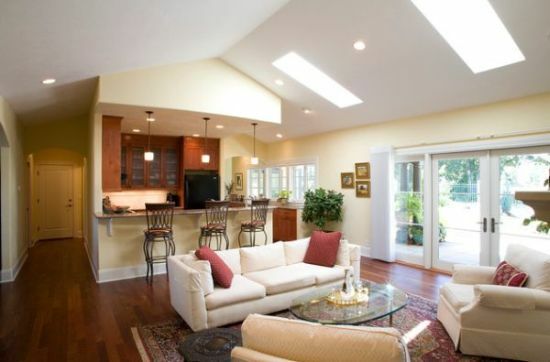 Such skylights help in creating a bright space and offer warmth throughout the day. The skylight in the image is fixed to the roof and offers quite a lot of natural light to the decor and illuminates the doorway leading to the main seating area. 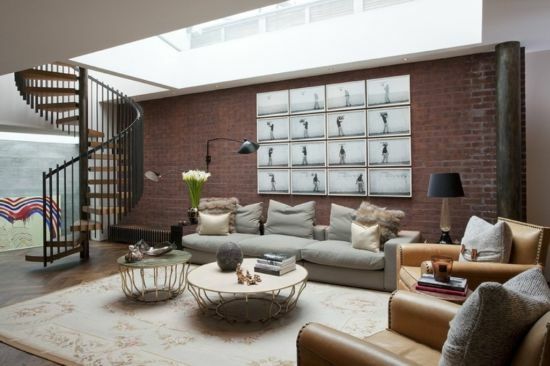 The sublime aesthetic beauty of this living room catches your attention on the first glance. Why? Well, the clear glass skylights allow immense freshness and natural light to enter and spread its vibrant aura all around, thereby perking up all the corners and nooks. The bold skylight design seen lends a fresh lease of life to the decor and makes one feel eclectic. The positioning of the skylights is such that light can enter and illuminate the middle portion of the seating area. Guests entering this brightly lit living area would first seem to take notice of the wall to wall massive sized windows, plus the paneled skylights that adorn the rooftop and are built in the from of a grid. These two features successfully harness ample sun light and allow the room to look fresh and lively throughout the day. In the nights, one can simply lie down and gaze at the stars. With a marble flooring added as an extra feather to this awesome interior decor, natural light seems to seep deeper inside the space and makes it warm and friendly. As you can see, there are quite a large variety of living room skylight designs available in the market and we hope this article helps you with any lingering query. I absolutely love natural lighting inside the home, and I try to let as much light as possible in through my windows. 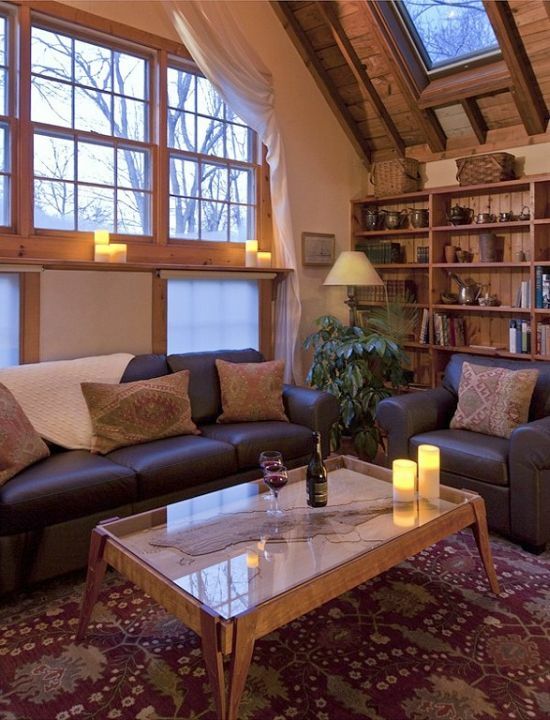 All these picture of skylights make me wish that I had some in my living room just like them. I really like the style of the room in numer 10. It reminds me of a beautiful greenhouse! You have written a great post on skylight that how skylights make our homes and living rooms decorative. They are a good source of sunlight.